Gelsenkirchen - FC Schalke 04 ran out 4-1 winners over FC Augsburg to carry their good European form over into the Bundesliga. Relief was the predominant emotion around the Veltins Arena post-match. bundesliga.com rounds up the thoughts of central characters. 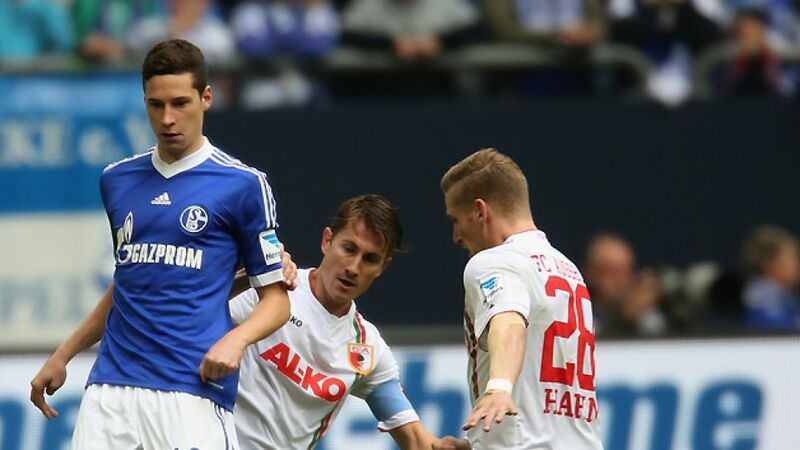 Julian Draxler: We were asleep during the opening stages. The quick equaliser and the red card jolted us awake though. That was the turning point which made things a bit easier for us, and from there on in we dominated the match. Kevin-Prince Boateng: We knew that Augsburg would be tricky opponents, and it was hard early on because they began well. Despite the boost from the equaliser, it's not always as easy as it seems playing against ten men, and after 2-1 we really tried to up the pressure. I'm proud of the boys, we're all really happy. Adam Szalai: I was lucky with two great assists from Atsuto Uchida and Dennis Aogo. I'm also delighted that we followed up our midweek victory over Basel. It's not been easy in the last few weeks with the sheer number of games. Jan-Ingwer Callsen-Bracker: We started well, we created chances and deserved the goal we scored. Unfortunately, it all went downhill from there. We wanted to defend well and hit on the counter after the red card, but after their third goal, it was all over really. Sascha Mölders: We didn't take any points from today, so I can't really enjoy my goal. It would have been a great game at eleven against eleven, but this loss won't knock us off course. We'll keep working hard.